Characterized by many historically significant events, such as the invention of the printing press, the discovery of the New World, and the Protestant Reformation, the years between 1300 and 1600 are a remarkably rich source of ideas about the mind. They witnessed a resurgence of Aristotelianism and Platonism and the development of humanism. However, philosophical understanding of the complex arguments and debates during this period remain difficult to grasp. 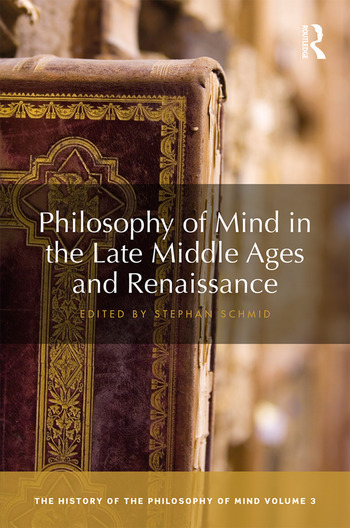 Philosophy of Mind in the Late Middle Ages and Renaissance provides an outstanding survey of philosophy of mind in this fascinating and still controversial period and examines the thought of figures such as Aquinas, Suárez, and Ficino. Essential reading for students and researchers in philosophy of mind, medieval philosophy, and the history of philosophy, Philosophy of Mind in the Late Middle Ages and Renaissance is also a valuable resource for those in related disciplines such as religion, literature, and Renaissance studies. Stephan Schmid is Professor for the History of Philosophy at the University of Hamburg, Germany. He mainly works on Late Medieval and Early Modern philosophy, focusing on debates in metaphysics, epistemology, and philosophy of mind, with a special interest in how these discussions are carried forward in present-day analytic philosophy. He has published on Aquinas, Scotus, Ockham, Suárez, Descartes, Spinoza, Malebranche, and Hume and is the author of Finalursachen in der frühen Neuzeit (2011).